You probably have noticed that while inside Google Drive, one cannot easily extract nor preview zipped files straight from Drive's interface. Google Drive is still deprived of that native functionality and one has to manually download the entire archived file to obtain its contents. I've been using Google Drive since its initial rollout. Although not my main virtual drive for backups, I use it primarily to store personal documents and some work-related files. And Google Drive being developed by Google gives you tight integrations with other G Apps. And for occasions when you need to recover a file inside a large compressed ZIP file hosted on Google Drive, you better skip the hassle of manually downloading it yourself and just browse it on-the-fly. Here we will show you a smarter way to unzip archived files and browse extracted straight from Google Drive. The trick is easy. While you're on your Drive's folder, just right-click any zipped file and click on Connect more apps. Just search for “Zip Extractor”. Once installed, refresh your Drive's page. You can right-click again the zip file and Google Drive now gives you the option to open it with Zip Extractor. Another decent Drive app is Zip, Unzip App. 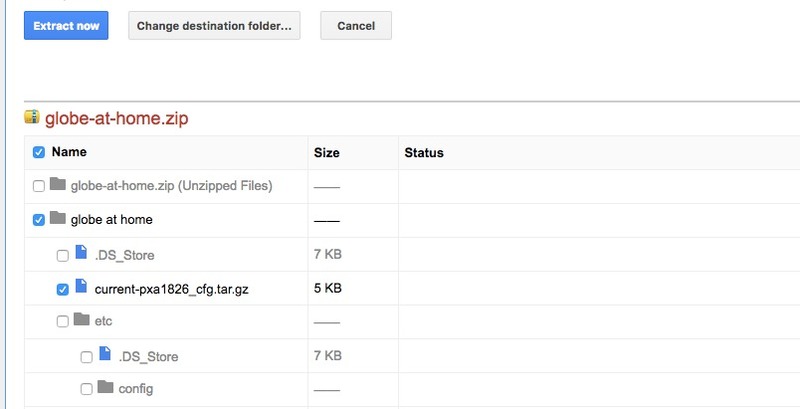 Just like Zip Extractor, it lets you preview and browse zip files straight from Google Drive. What I like about Zip, Unzip App is that it quickly gives you a unique URL for each file found inside your zip file. The UI may need attention though but for a simple task of obtaining a specific file inside a ZIP file on Google Drive? I would go for Zip, Unzip App. There you go! Google Drive definitely needs a lot of catching up when it comes to dealing with common file types like ZIP files. 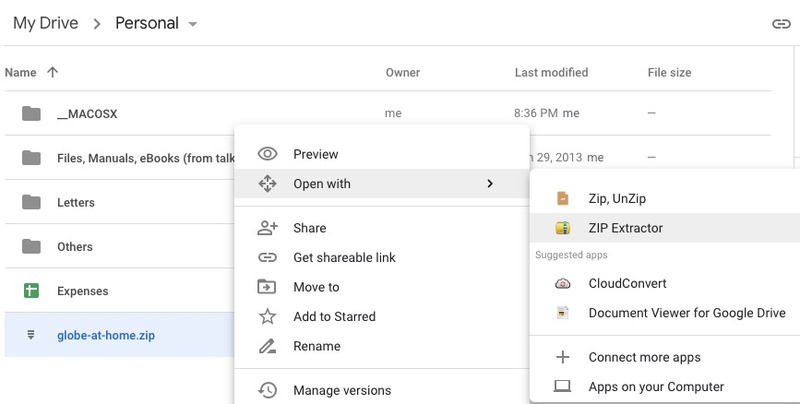 Being able to preview what's inside a zipped file is already a built-in feature in DropBox, but not in Google Drive. Unless you're on an unlimited data plan and your phone still has gigabytes of extra space at your disposal, you can skip this guide now. However, if you are a heavy WhatsApp user under a throttled, capped data plan and notice that sudden drop of available phone storage space, then, this guide is for you. 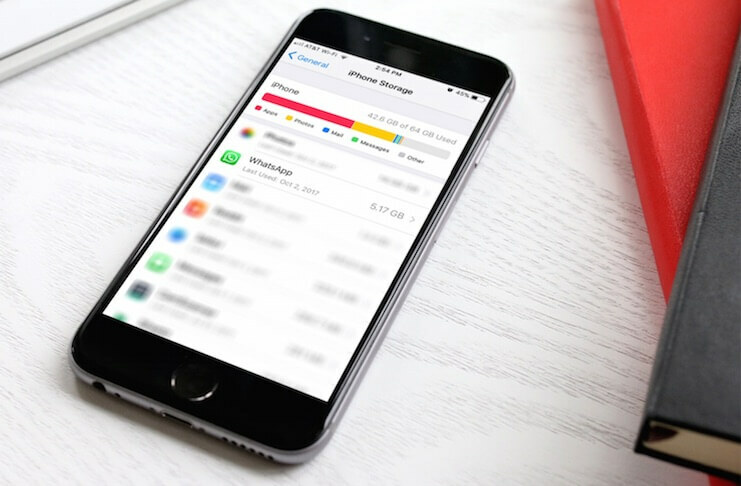 In this article, we will show you how you can save precious data and free up some space on your iPhone or Android by restricting WhatsApp from automatically downloading shared photos, videos, and documents on your phone. WhatsApp by default automatically downloads photos or videos being shared within the app so you get the best possible user experience. But if that UX feature means exhausting our data plan fast while shrinking our storage space, then, we don't want that. The process is easy, you just need to go to WhatsApp Settings tab and just fiddle around those toggles and checkboxes. Navigate to Settings > Data and storage usage. Just scroll down and under Media auto-download, tap on When using mobile data. It should bring you a dialog. Just uncheck Photos, Audio, Videos, and Documents. Do the same process for When connected on Wi-Fi and When Roaming options. Restricting WhatsApp from automatically downloading photos or videos is one simple action that can save you both space and data. 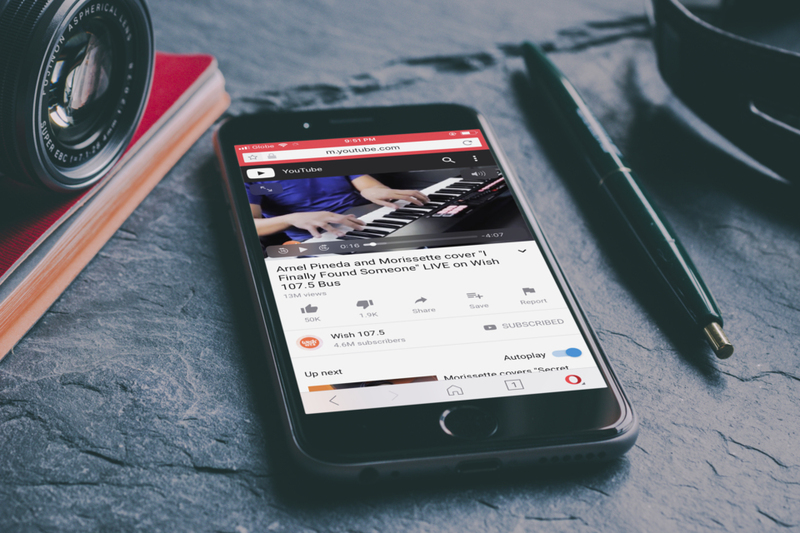 Have you ever found yourself in a situation where you needed to play that awesome YouTube channels containing your favorite music covers straight from your iPhone or iPad? Well, probably, not once. While consuming those eargasmic treats and performances from your favorite artists is a straight-out simple to do on YouTube's official iOS app, you'll be forced to keep the YouTube app opened or else video playback will stop as soon as you exit or open another app. YouTube makes money through ads. So it just makes sense for them to disallow video playback in the background on iPhone or Android to maintain the ad impression count. In the current YouTube iOS app, there's no background playback support and it's always impossible to continuously enjoy YouTube videos while you're busy browsing Safari or chatting a friend on Messenger. 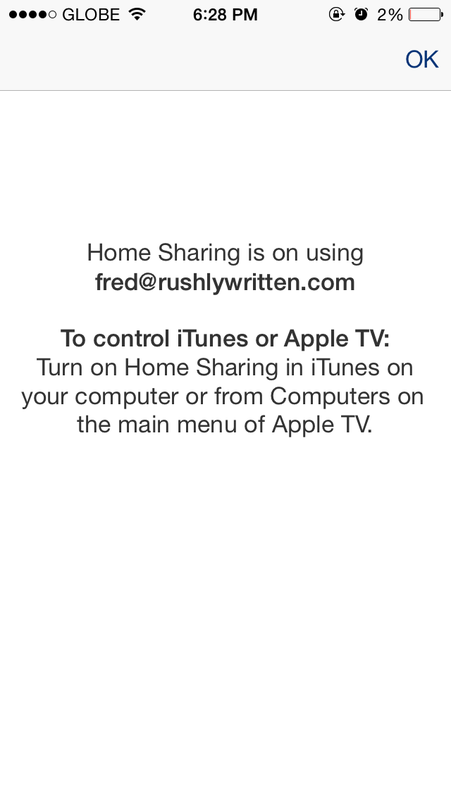 However, if you really need to play YouTube in the background on your iPhone or iPad while giving you the freedom to open other apps, here's a simple trick. The quickest way to continuously play YouTube in the background on iOS is to play it in Opera Mini. Once you have Opera Mini installed, just launch that browser and go to youtube.com and search for your video or you can simply paste the video URL in the address bar. As soon as your YouTube video begins to play, click the iPhone's home button to exit the app, which normally pauses the media playback. 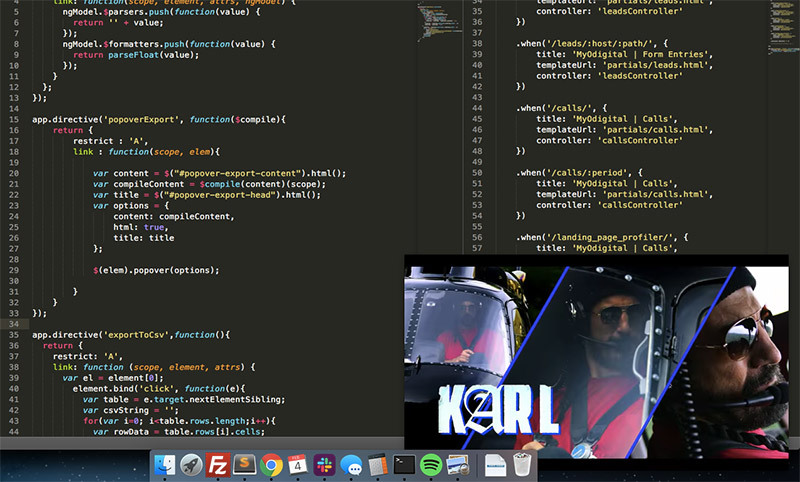 Next, bring in iOS' Control Center and hit on the Play button to continue YouTube's media playback. This trick works well even if your lock screen is active or you open other apps. And the best part? It can auto-play succeeding videos as long as you enabled auto-play in the video player and iPhone's Background Refresh is turned on. YouTube, being the second largest search engine in the world, hosts a staggering 5+ billion of videos as of 2018, ranging from user-generated tutorials, guides, music videos, movie trailers and more. With that figure, it's easy to see why the video platform snags a whooping 500+ millions of views daily on smartphones alone. These are the most essential smart home devices to give you a headstart with smart home living without breaking the bank. These smart home devices we hand-picked are all affordable, requires no technical know-how, and an absolute joy to use. Unless you’re in a cave in the past few months minding your own business, skipping all the smart home technology headlines, you probably have heard of Internet-of-Things (IoT) and connected smart home devices. The easiest definition of Internet-of-Things (IoT) I can think of is that it’s just a network like an internet where all your smart home devices are connected. IoT typically operates on top of your existing home WiFi network, so you can just simply imagine of IoT as a network of home devices within your existing home network. Forbes predicts that by 2022, people would spend $1.22T on IoT devices and a global market that will continue to burgeon each year. No wonder the annual Consumer Electronics Show (CES) continues to surprise us with cool and bizarre IoT gadgets, ranging from robotic cleaners, smart locks and pet food dispenser. Smart home technology or IoT devices - what are they? the ability to automate routinary tasks like preparing your morning brew, starting your heater, turning on your cooling system at home while driving from work, turning off virtually any appliance at a certain time (and save money in the process), etc. One popular notion of having connected home devices setup is that it’s going to cost you a fortune and it’s bloody rocket science to set up. That’s plainly wrong. While some well-promoted IoT devices can be costly, that doesn’t mean you need to follow the herd and just buy what other people buy. We can just start off with the basics, the least costly ones, to give you the feel what it’s like to have IoT at home. And in this guide, we’ll even skip using smart home hubs and controllers like Amazon Echo or the highly recommended Wink Hub 2. Hubs and controllers are all optional. No must-have smart home devices list is complete without smart plugs. 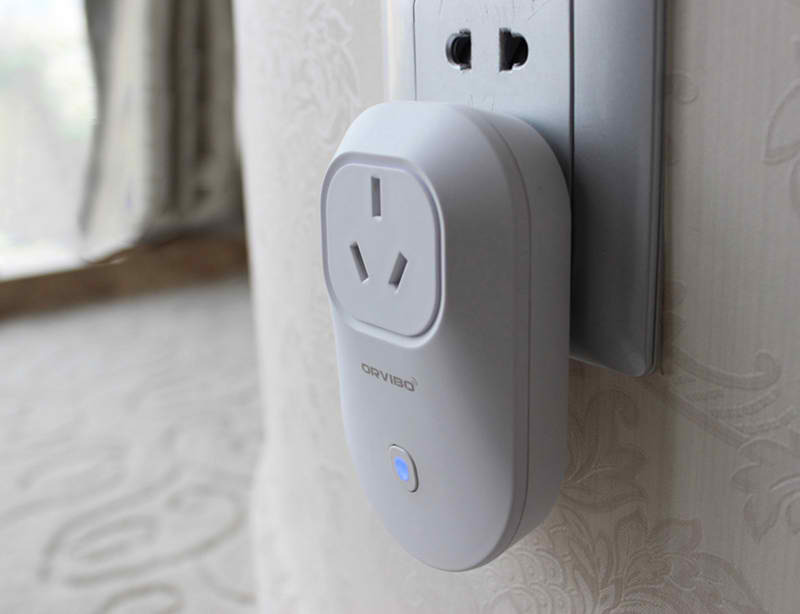 Also known as Wifi Smart Sockets or Smart Wifi Outlets, smart plug essentially lets you wirelessly control nearly every single home appliance using your iPhone or Android device. This magical device gives your home appliance wireless connectivity so you can remotely turn them on or off right at your fingertips or schedule your appliance to be automatically turned on or off at a certain time. I have an old window-type aircon which unfortunately doesn’t have a timer, but with Wifi Smart Sockets, I can easily put a timer and let it automatically turn off at 3 am without interrupting my slumber. Do you want to wake up from the smell of freshly brewed coffee in your kitchen? Simply prepare the beans/filter a night before and plug your coffeemaker in a smart plug. You can get it to automatically brew your coffee the next day or brew it using your iPhone while you’re in bed scanning your emails. Of course, the fun doesn’t stop there. You can plug in your other home appliances like electric fans, water heaters and control them wirelessly at your fingertips. There are a plethora of smart wifi sockets to choose from, some even have nifty features like energy usage tracker, Amazon Echo, and Google Home integration so you can simply control them with your voice. The most important Wifi Smart Socket feature to look for is a timer, where it completely cuts power after a timer expires. You can score a decent smart plug at Amazon like the Orvibo S25 Wi-Fi Smart Socket which starts at $15 as of writing or from your local online store. What if you can dim your light or control your ambiance within your iPhone or Android device or by simply asking Siri or Alexa to do so? That’s exactly what smart lighting is all about. 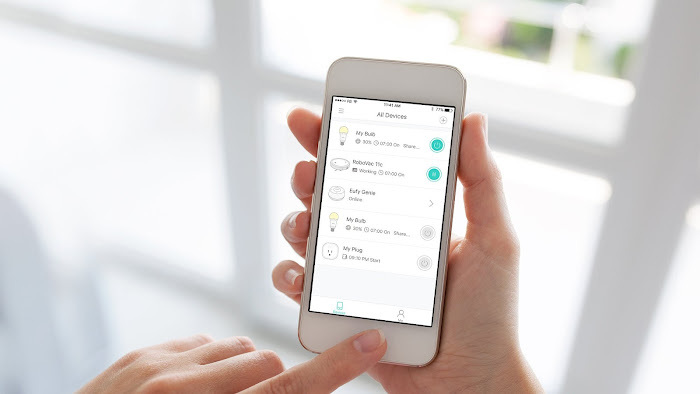 You get a smart bulb and a special device (bridge) acting as a connector so you can remotely control the bulb wirelessly. In smart lighting category, Philips Hue Smart Lighting Kit is definitely king. But it comes at a price. However, there is decent Philips Hue alternative you can try like the cheaper, all-white version Philips Hue White. Or if that’s still expensive, Eufy Lumos Smart Bulb is a good Philips Hue line alternative. 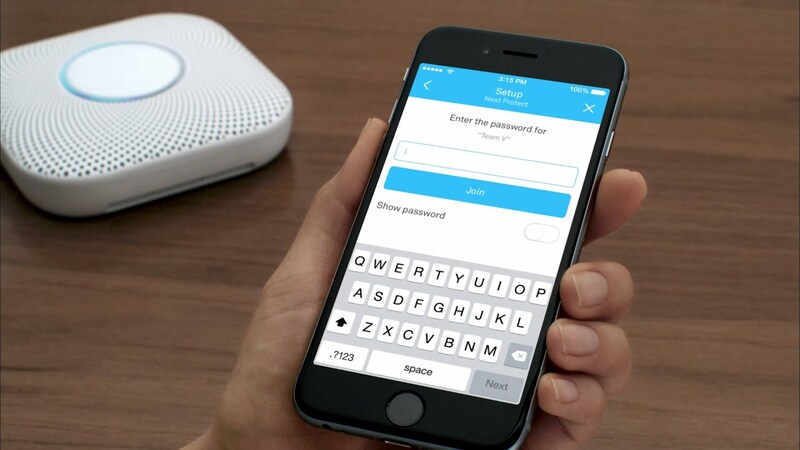 Another welcome addition to your home security system, this category of the internet-connected device lets you monitor your home away from home. This top-rated monitoring device Wyze Cam Pan for instance alerts you when there are possible intrusions within your premises. It has a night vision capability, can track moving object and can detect sounds. 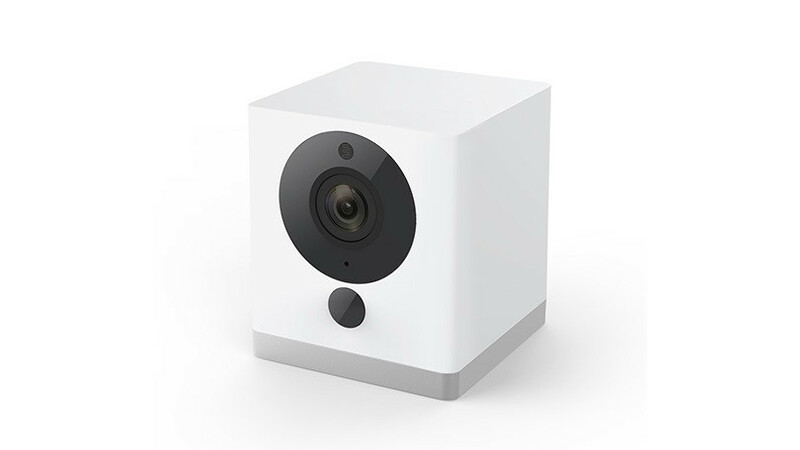 Most smart motion-sensing devices usually work with Alexa so you can simply ask Alexa to show your front door, kid’s room, or anywhere else you have your Wyze Cam Pan. Smart smoke detector? Why not! I’m extra paranoid when it comes to fire so I don’t mind forking out a few bucks for smart smoke alarms. Smart smoke detector essentially alerts you when there’s a fire even if you’re miles away from home. This special type of device connects to your iPhone or iPad over wifi or cellular so you’ll be quickly alerted when there are smokes detected. Nest Protect is always a good one you can invest in but there is also excellent Nest Protect alternatives you can check in. Just search for it on Amazon or eBay. 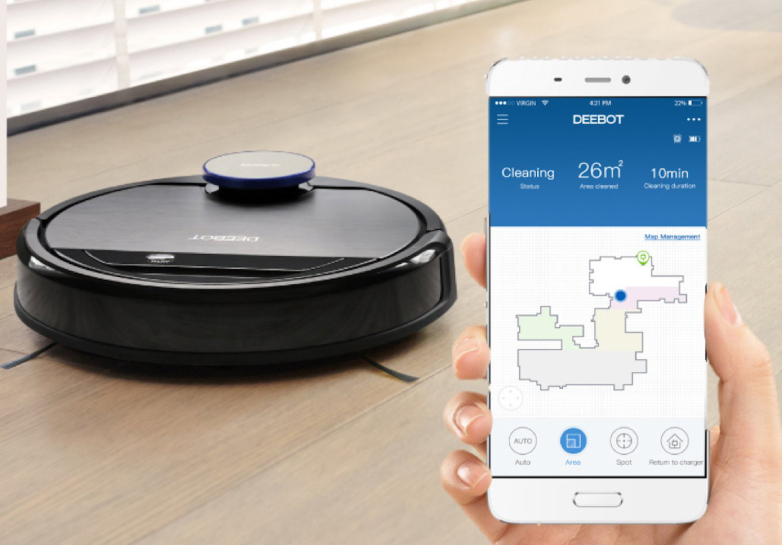 Just when you thought IoT can’t be any cooler, I’m ending this list with smart home cleaners. This category of a connected home device can do all the dirty work of keeping your room dust-free. Robot vacuums normally come with a smart app where you can schedule or initiate cleaning session or you can simply ask Alexa or Google Home to start the job. Ecovacs Self-Charging Robot Vacuum Cleaner is a popular option under this category, but feel free to explore more that works for you. Again, smart home hubs and controllers like Amazon Echo are all optional. The above-mentioned smart home devices will continue to work without Amazon Echo or Google Home unless you’re willing to spend more and take your home automation game to the next level. DISCLAIMER: This is my first Shortcuts created for the sole purpose of demonstrating how powerful Shortcuts is. 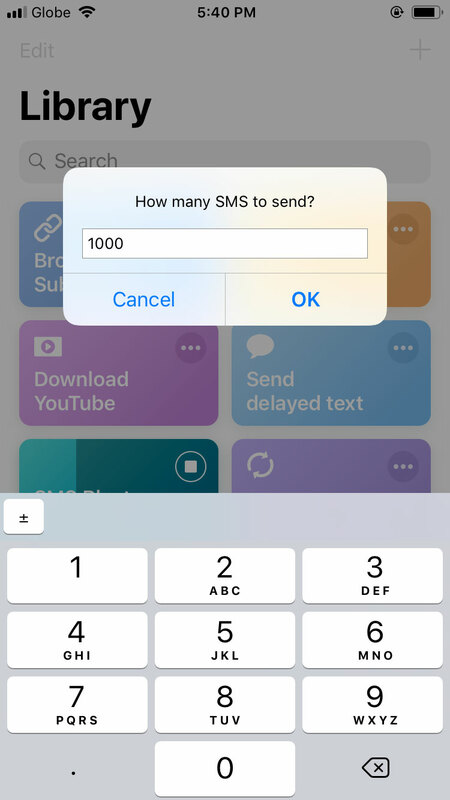 With the right mix of macros, it is now possible to text blast any phone number using your iPhone. Please use it at your own risk. Have you ever thought of pranking your friends by SMS bombing them with unlimited number of text messages? Or you constantly receive text scams and you just wanted to return the favour by text blasting them? Whatever your motivation is, it's now possible to text blast straight from your iPhone with ease.And no need to jailbreak or install a risky, third-party app. I'll probably go to hell for creating such Shortcut, but I find it fun to prank those spammers who keep on sending unsolicited messages. 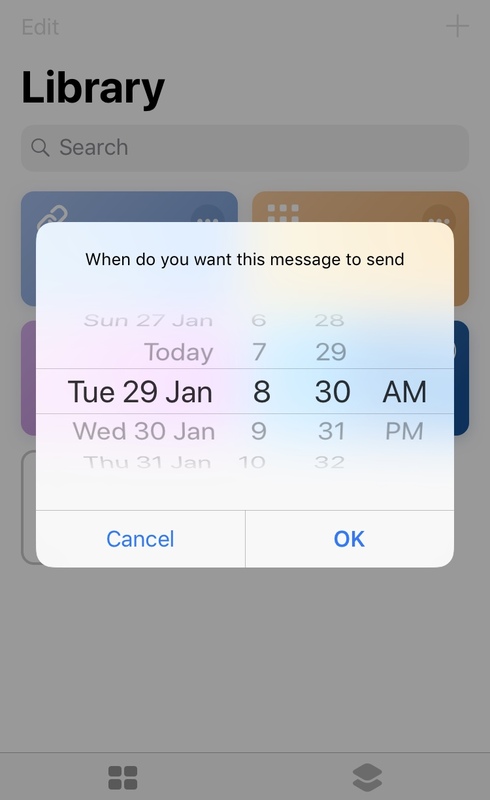 Probably one of the most requested features on iOS is the ability to schedule text message to be sent at specific date and time. 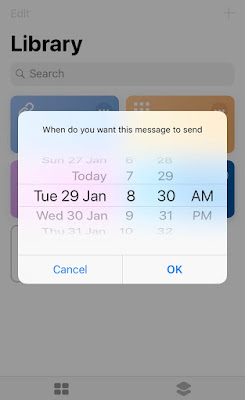 Being able to automatically send an SMS at future date and time is prove useful especially for those people who want to plan in advance. 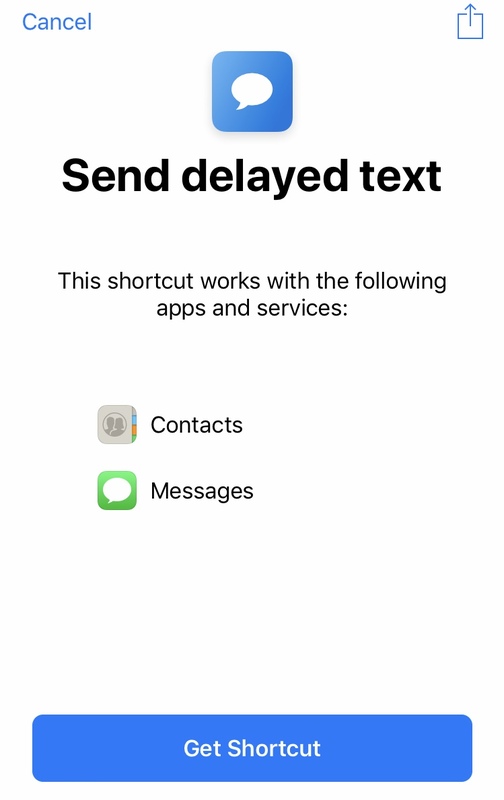 We've previously talked about SMS scheduler options before to send a timed message but that list is now too outdated and requires a third-party app to work. 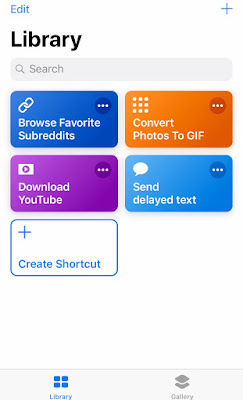 Download and install Siri Shortcuts by Apple. It's coded by Apple so it's 100% safe. 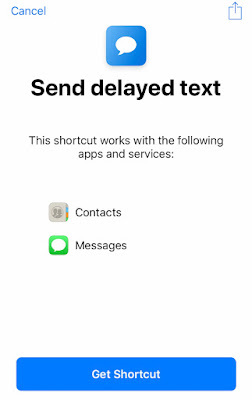 Once installed, grab this Send delayed text Siri Shortcuts. 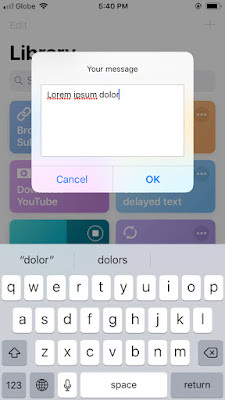 This is the magic sauce to make auto-sending of iMessage a breeze. And you're done! 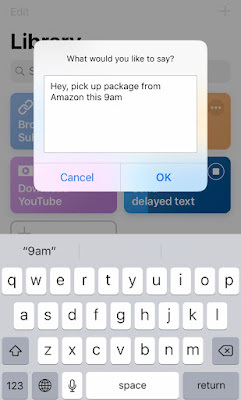 Your message will be automatically sent at predefined date and time. So there. We're basically exploiting Siri's Shortcuts capability to send schedule text message at later time. The introduction of Siri Shortcuts from iOS 12.0+ and later truly brings a surprising level of extensibility in the walled garden of iOS. 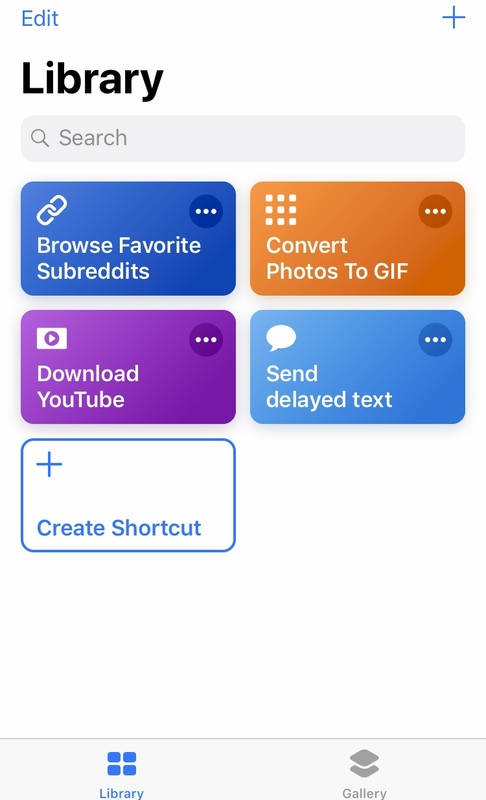 Go, give Shortcuts a try and explore the pre-made Shortcuts to get things done fast! As what ultra-minimalist Steve Jobs famously once said, we “improve by removing more”. That's one of the guiding maxims of Apple that helped propel its way to greatness in the techno-wizardry scene. Now, if you're convinced with that guiding principle of Apple, why not apply that same ethos into how you consume your music and movies? I'm talking about those classic wired surround speakers & subwoofer systems sitting on your desk right now and all its tangled wires glory. While this wired speaker system works just fine, why not free yourself from all these clutter and get that simple joy of wireless you deserve? If you have a good old non-wireless loudspeaker lying around in the corner, don't throw that just yet. The truth is you can make it "cool" again by repurposing and turning it into a wireless Bluetooth speaker so you can wirelessly fire up your favorite Spotify playlist from the comfort of your fingertips. Step 1 Get your preferred Bluetooth Audio Receiver from your favorite shop like Amazon. I scored a decent Bluetooth Receiver from Lazada for only Php 330.00 ($7). Sweet. 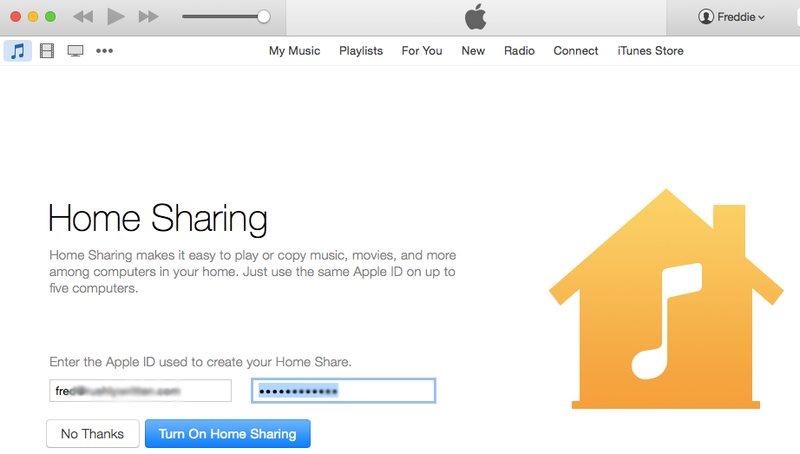 You can now listen to your favourite music from iTunes or Spotify while you can freely move around. Ever ran into a problem trying to download an email attachment in Gmail but you can’t because Gmail's virus scanner says it's a virus and unsafe to download? 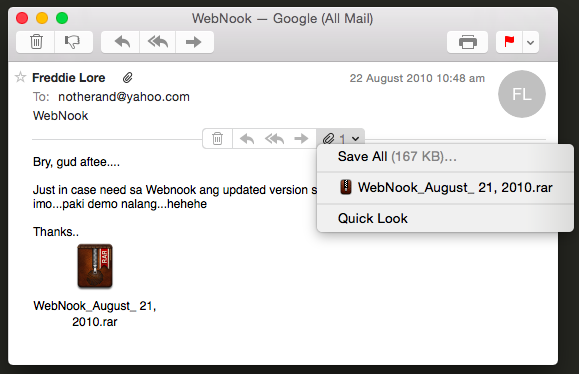 Few days ago, I ran into the same problem trying to retrieve my old email attachment in Gmail I sent five years ago. The file contains an executable file I wrapped in a zip file. But Gmail deems it as a malware and they cannot allow me to download the file at all cost (see screenshot below). It does makes sense, and it's a proactive step imposed by Google to prevent malicious programs to get inside and contaminate our computers. But in case you need to access blocked email attachment and you're certain it's just false positive, then, here's a neat trick on how to circumvent this restriction and download blocked attachment in Gmail. The trick is easy. Just launch your Gmail account in a third party desktop app like Outlook for Windows or Mail for Mac. For Mac Just launch Mail app. Be sure to add your Gmail account in your Mac and navigate to that account to get all your emails. Once you get there, rummage through your inbox and search for the email attachment you want to download. For Windows Be sure you have your Outlook or Windows Mail correctly setup. If you're on Windows 10, the setup should be pretty straight-forward. Once your Outlook is up, just search for that particular email attachment and you should be able to download it without any problems. 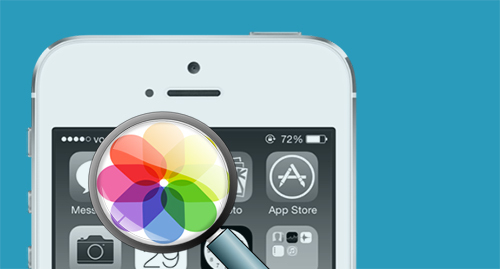 Learn how you can use IFTTT as an iOS photo spy software to secretly copy every single picture taken on your spouse or kid's iPhone, iPad. Automatically get a backup of every iOS photo including selfies, n*des and other inappropriate snaps. WARNING: The author shall not be held responsible or liable for any misuse of the app detailed on this post. The method outlined below can get you in serious trouble. Do it at your own risk. Been fiddling around with IFTTT few days ago and I accidentally discovered that you can actually use IFTTT iOS app as a FREE spy app to secretly collect, monitor every single iOS photo being taken on your spouse or daughter's iPhonE, iPad. Good news is: the process is no rocket science and you don't have to spend a penny nor you need to jailbreak your iOS device to accomplish this. 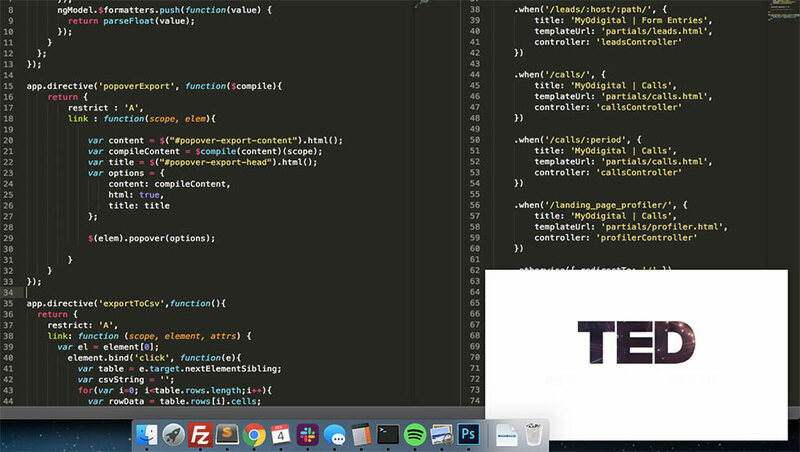 For the uninitiated, IFTTT (If This, Then That) is a massively popular web automation service that allows you to automatically perform certain actions based on your conditions (or triggers). IFTTT termed them as recipes, and there are plenty of recipes flooded out there that should help you save time by automating certain asks. 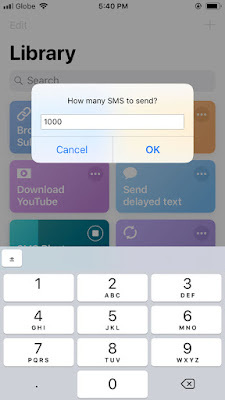 One good example is you can get SMS alerts from specific email addresses, or you can let your device to automatically send screenshots to your email. Step 1 Compel your target to install IFTTT. Sure it won't be a problem as IFTTT has hundreds of awesome recipes up its sleeve. 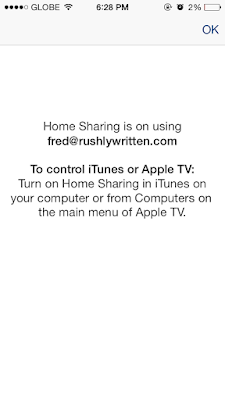 If you know your partner's iTunes account, then, that's a bonus as you can install the IFTTT straight away. Step 2 Once you've successfully installed IFTTT, best to burry it in the Utilities folder or anywhere that's least accessed. Step 4 Disable IFTTT's iOS Notification to ensure your target won't get notified every time the recipe runs. Go to Settings > Notifications, select IF and turn off Allow Notifications slider. a) The target's iPhone or iPad should be connected to the internet for this remote photo spying method to work. Not necessarily connected all the time but should be connected once in a while so IFTTT can push new photos to their server. I don't want this recipe to be called as an exploit but rather a heaven-sent functionality you can use to spy on anyone's iPhone and be in the know what your daughter, girlfriend or wife is up to. Now that Apple Music is finally out, you probably have given it a spin and eventually fell in love with the app. It is hard not to fall in love with Apple's streaming app; its much larger iTunes library plus better radio recommendation make it really a prime music app you can't miss. And if you've finally decided to move from Spotify to Apple Music, your next step should be: export all your Spotify playlists and import them to Apple Music all at once. And that's the painful part as currently Apple hasn't rolled out yet its own migration tool that makes it easy to move, import your Spotify playlist to Apple Music. And no, both Exportify and Beats Music migration tool do not work either as yet. 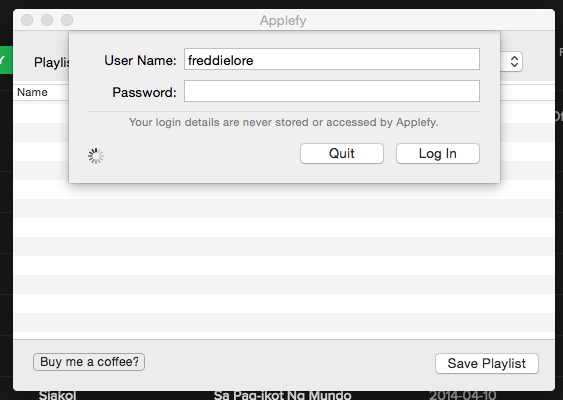 Step 4 Navigate to your home folder and there will be a folder called Applefy (bring your Spotlight and search for Applefy. This folder contains your exported Spotify playlist containing MP3s. Step 7 Once the songs have been registered, right click again and hit 'Remove download', you can now stream or download the full song using your Apple Music subscription. 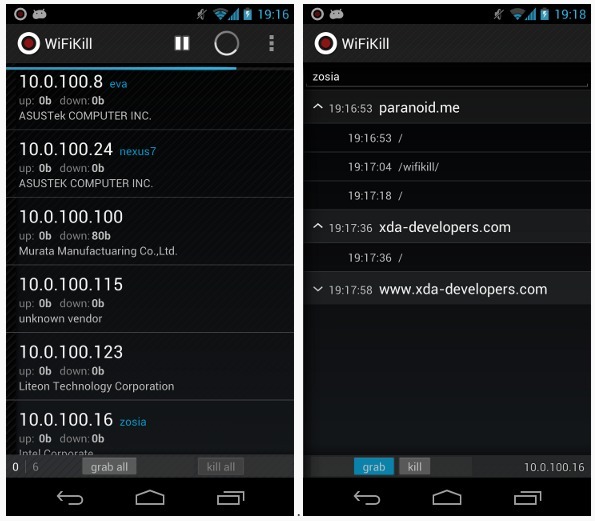 Disclaimer: The purpose of this tutorial is to demonstrate just as how easy it is for anyone with a rooted Android phone to take control of the entire WiFi network you're currently on be it at home, cafes and school. While we believe that the tool and the method you are about to read can be an invaluable one if prudently used, we do not condone nor promote the idea of manipulating one's wireless network to your advantage. Please use this at your own risk. Web Archive is everyone's go-to place when they want to see how a specific website looks in the past. It's a wayback-machine that randomly creates snapshots of your site as reference so you can anytime check back when your site's gone awry in the future. While Web Archive is one reliable tool to do just that, you cannot however specify how frequent a snapshot should be created. If you want to automatically create a site snapshop daily or weekly, then, Google Spreadsheet can do you a favor. 1 Go to Screenshotmachine.com and create a FREE account. After sign up you will get an account key necessary for the API request. 2 Sign-in to your Google account and make a copy of this Google sheet (File > Make a copy). 3 Provide the required parameters as required like Account Key, URL to Capture and Capture Frequency. 4 Click Verify Now button to see if the API works or not. If it works, a new folder called Web page captures should be automatically created on your Google Drive account. This is where all screenshots will be saved. Note: you’ll get a pop-up asking for authorization. Grant the necessary access. 5 Click Start Capturing button. You're done. Depending on the capture frequency you specify, Google Sheet should automatically instructs Screenshotmachine.com to create a site snapshot and send it back to Google Drive. One of my favorite features of Google Sheet is the importXML function which basically allows you to grab contents from another site. It's one pretty useful feature of Google Sheet as it saves you time especially if you're asked to web scrape or copy the entire contents of a site. The information you get can then be imported to your website using the right apps and tools like WP All Import (if you're using WordPress as your site platform). So next time you're asked to export the existing content of a website, then, importXML of Google Sheet is one nice function you can exploit. There's no denying that we are all slowly becoming too dependent on Google apps. From a simple task of digging the world's information down to locating the nearby coffee shop, we always turn to Google and get the information we want in the blink of an eye. 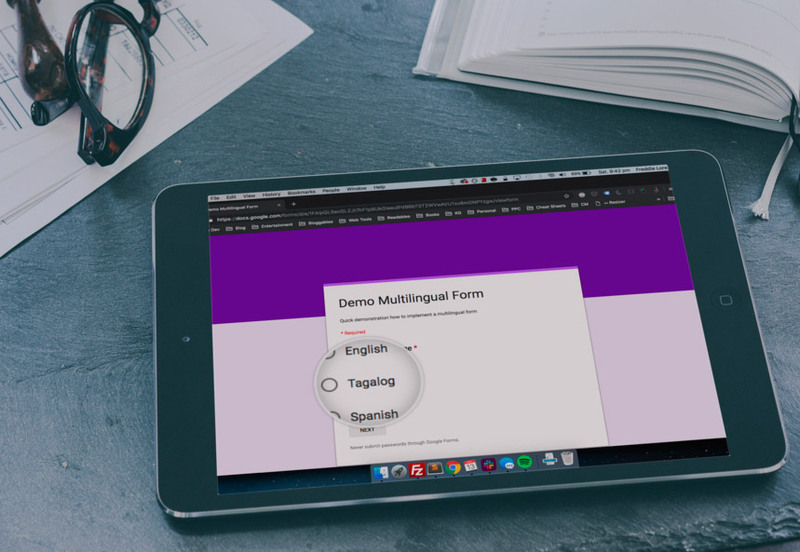 One of the best web services that Google has ever made for everyone is the Google Docs suite. Its powerful, cloud-centric features along with its ever-improving mobile app makes it really a mature and capable platform. But just as every finest web app available in the wild, there are things that you might have missed & didn't realized you could do with Google Sheet app. And in this post, we are going to explore some of the lesser-known Google Sheet hacks and tricks to make your digital life a lot easier. If you have a blog or website, you know exactly how important web monitoring apps like Pingdom and Uptime Party can be. These are apps designed to monitor your website's uptime that should alert you in real-time when your site is down or inaccessible. These website monitoring apps work great, but they often come with a price. In case you need a FREE Pingdom alternative, you can turn to Google Spreadsheet and use it as a website monitoring tool to track your site's downtime and uptime. As with premium apps like Pingdom, you get instant email or SMS notification delivered straight to your inbox once your site is down. The process should only take about a minute or so to setup, and you're good to go. 2 Put your website URLs in cell B2 (comma separated) and your email address in cell B3. If you wish to receive alerts by text messages, put Yes in cell B4. 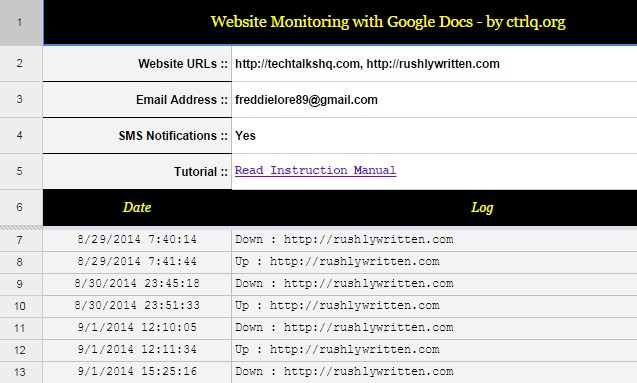 3 You’ll find a new Website Monitor menu in your Google Sheets toolbar. Click Initialize and you’ll get a pop-up asking for authorization. Grant the necessary access. 4 Go to the Website Monitor menu again and choose “Start Website Monitor” to begin the monitoring process. 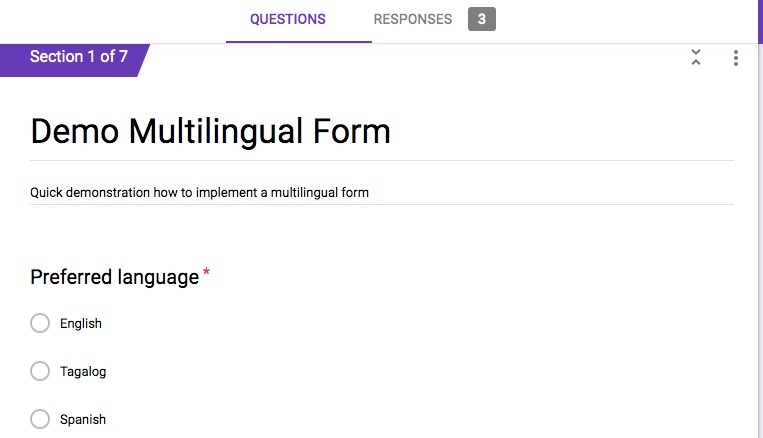 Close the Google Sheet. No matter how advance Project Management and CRM tools can get, no one can ever ditch Google Sheet. Google Sheet is still one powerful tool that if you know how to exploit the service to your advantage, you know that it's more than just a spreadsheet-editing software. And if you're using Google Sheet as an additional tool aside from your usual project management service, here's a nifty tip on how to enable email notification so you'll be notified in real-time whenever a collaborator is making some updates on a shared spreadsheet; no need for you to waste time waiting for hours for other collaborators to update the sheet. Open the spreadsheet where you want to get notified for any changes. Go to the Tools > Notification rules. In the window that popups, select when and how often you want to receive email notifications. You may also need to setup email push notification on your smartphone so that no emails will be missed. Google Sheet is still my go-to place when it comes to working and collaborating with clients for a specific project. During a website pre-deployment, after the QA, we have a client review phase where a client is expected to inspect and jot down all design & functionality hiccups of a website. While BaseCamp, Asana or Teamwork may be used to collect the findings, I find it a lot time-saver and efficient if I can get a consolidated view of all findings inside a single Google sheet. And now that I can setup email notification, both the client and I can save time.